Evolutionists repeatedly claim that their assembled chain of mammal-like reptiles shows a step-by-step morphological progression to mammals. Despite this, a close and simultaneous examination of hundreds of anatomical character traits shows no such thing, even if one takes basic evolutionary suppositions as a given. Very many, if not most, of the pelycosaur and therapsid traits used in recent evolutionistic studies to construct cladograms actually show a contradictory pattern of progression towards, followed by reversion away from, the presumed eventual mammalian condition. Furthermore, gaps are systematic throughout the pelycosaur-therapsid-mammalian ‘sequence’, and these gaps are actually larger than the existing segments of the ‘chain’. These sobering facts demonstrate that, however the supposed evolutionary ‘lineage’ of mammal-like reptiles towards mammals is interpreted, it is divorced from reality. The so-called mammal-like reptiles are believed by evolutionists to be the ancestors of the mammals and to have become more mammal-like with the passage of time. Evolutionists consider anatomical traits to be mammal-like if they occur in modern mammals but not in other modern vertebrates. A more fundamental issue, however, is that evolutionistic claims about transitional character states (however these states are defined) typically centre on a relatively small number of features. These features are pieced together and cited as examples of evolutionary change towards reptiles that are increasingly mammal-like. This claim is made despite the fact that evolutionists are usually not concerned with ancestor-descendant relationships, but rather the degree of presumed evolutionary relatedness between mammal-like reptiles. Yet, using isolated bits of evidence, we could construct just about any progression we wanted. We could, for instance, arrange a sequence of spoons to show a progression in size, thickness, etc. And this would be all the more questionable if only parts of the spoons were considered (e.g. the spoons arranged to show a trend towards greater bowl size while the handles showed no trend at all). Clearly, a comprehensive approach is needed. All the anatomical features must be considered, not just a few. Accordingly, this work evaluates the claim that mammal-like reptiles, as arranged in succession by evolutionists (from pelycosaurs to mammals), show an essentially unbroken chain of progressively more mammal-like fossils. We examine large numbers of inferred morphological changes, simultaneously considering literally hundreds of characters that have been used by evolutionists in the construction of cladograms (branching patterns showing alleged degrees of evolutionary relatedness of one form to another). Even though cladograms are not intended to identify ancestor-descendant relationships, each node (branching point) in the cladogram is taken by evolutionists to be, more or less, morphologically intermediate between the previous node and the successive one. To keep track of hundreds of anatomical changes, and analyze these changes semi-quantitatively, requires a method of scoring the extent of each change, and tabulating the total number of changes. One way would be to sum the character polarities that evolutionists use to construct their own cladograms.5 To briefly demonstrate the methodology used in the present study, I have arranged seven hypothetical organisms in a series (Figure 1), to indicate evolution from (A) to (G). This series can be viewed either in the traditional ancestor-descendant sense or in a cladistic sense. Cladistically, evolutionists would consider ‘organism’ (A) to represent the least derived (earliest evolved) state and (G) the most derived (most recently evolved), but without any necessary connotation of immediate ancestor-descendant relationships. Figure 1. Seven hypothetical organisms arranged in a series to indicate evolution from (A) to (G). The general stratigraphic succession of (A) through (G) is accepted as a given. In the traditional evolutionary sense, this series can be viewed as an ancestor-descendent relationship with (A) the ancestor of all other 'organisms'. Cladistically, (A) would be the least derived (earliest evolved) and (G) the most derived (most recently evolved). Of the five morphological traits shown, three are progressive (cap-morph, X-morph). Two are gradational (circle-morph, X-morph) while the others have a polar nature, being either present or absent. Consider how progressive traits would be scored. Progressive traits proceed unidirectionally through the sequence that the evolutionists have constructed. Note that ‘organisms’ (A) through (D) don’t have the ‘cap-morph’ trait, but ‘organisms’ (E) through (G) do. This trait is a ‘presence-absence’ (zero-one) polarity trait, and can be scored as (0000111) in the sequence of seven ‘organisms’. In like manner, the ‘triangle-morph’ can be scored as (0000001), since it only appears in the most derived ‘organism’. The progressive ‘circle-morphs’, by contrast, are also gradational, increasing from zero to three circles per ‘organism’. This ‘evolutionary trend’ can be scored as (0011233). Look at what I call reversing traits: ones that change direction at least once in the accepted evolutionary sequence. For instance, note that the ‘bar-morph’ first appears in (C) and continues in (D), only to disappear in (E). It then makes an ‘evolutionary reappearance’ in (F) and persists in (G). This reversing trait can be scored as (0011011). As a final example, a reversing yet gradational trait is provided by the ‘X-morph’, which can be scored as (0102212). We can quantify the overall changes from (A) through (G) by summing the character polarities of all the traits. The sum is (0124568). However, this sum distorts the picture of the changes, because the reversing traits make the overall change appear much smoother (transition-filled) than it really is. If we only sum the progressive character polarities, a much less gradational chain is obtained (0011345). Thus, to circumvent the bias created by mingling numerous reversing traits with progressive traits, I omit the reversing traits entirely in Table 1. Where reversing traits are relatively few in number (Tables 2 and 3), I sum all the traits in one list, and only the progressive traits in another. To what extent could the hypothetical evolutionary progression from (A) through (G), as shown in Figure 1, support the evolutionary claim about ‘transitional forms’? Obviously, it depends not only on how the polarities are summed, as discussed previously, but also on which particular polarities are emphasized. The ‘circle-morph’ shows the most incrementally-filled progression of traits (0011233), and could be argued to support an evolutionary scenario. By contrast, the ‘cap-morph’ and ‘triangle-morph’ appear as sudden jumps without any gradual ‘evolutionary’ development. And the reversing characters, which go from ‘primitive’ to ‘derived’ and back to ‘primitive’ again, cannot be said to constitute an evolutionary trend by any stretch of the imagination. As we shall see, these same principles that apply to the hypothetical organisms in Figure 1 also apply to actual fossils of mammal-like reptiles, and the evolutionistic claims about their supposed series of ‘intermediate stages’ culminating in mammals. Of course, the phrase ‘biologically associated’ smacks of evolutionistic just-so stories. However, in this study, I do not attempt to make any anatomical judgments, but rely on datasets provided by evolutionists. In this way, the negative conclusions regarding evolution become all the more compelling. One way to limit the extent of potential biases in choice of apomorphies,9 etc., is to use information from different authors, because each author has analyzed a largely-different set of anatomical characters. Accordingly, I employed three recently-published datasets for this comprehensive analysis as summarized in Tables 1, 2 and 3. To clarify the relationships between the members in each dataset, I have, as shown in all of the tables, assigned an identification number to each taxon.11 I have also used descriptive phrases for each entry in each table.12 Although the use of these descriptors here is informal, they approximate those used by Kemp.13 Adjectives such as ‘primitive’, ‘medial’ and ‘advanced’ (or ‘derived’) are used solely to follow the evolutionists in orienting the particular taxon relative to the mammalian condition, and are not intended to have any other connotation.14 They are definitely not intended to endorse any notions of succession of mammal-like reptiles through time, relative evolutionary relatedness of mammal-like reptiles, lineages of mammal-like reptiles or ancestor-descendant relationships. The first of the three datasets used in this study, by Sidor and Hopson,15 is essentially a broad overview of the entire sequence, starting with pelycosaurs and culminating in mammals. Because, as noted earlier, large numbers of reversing characters tend to confound the overall scoring of trends in the acquisition of mammalian characters, I have excluded these 77 reversing characters. More on this later. The relevant part of the data is summarized in Table 1,16 and consists of 88 anatomical characters.17 Not all of the taxons, however, have data available for all of the 88 useable characters. For this reason, all of the entries in Table 1 are each normalised by taking the sum of character polarities divided by the number of available characters, and then multiplying the quotient by 100.18 This is what I call the Mammalness Index in Tables 1–3. Table 1. Mammalness Index for mammal-like reptiles calculated from overall skeletal characters from Sidor and Hopson.15 The ID number approximates the relative position each taxon would have on one comprehensive cladogram (including all three Tables 1-3).11 Descriptions approximate Kemp13 and reflect evolutionary notions of the mammalian condition. The descriptions are not intended to endorse these evolutionary notions. The second database used (Table 2) is much more restricted in its anatomical scope, being confined to the presumed evolutionary changes in the quadrate bone. In fact, much of the discussion about mammal-like reptiles as presumed transitional forms centres on the alleged evolution of the mandibular-auditory system. Luo and Crompton19 have evaluated 14 characters relative to the quadrate bone in the reptilian jaw evolving into the eventual mammalian incus (one of the tiny bones in the ear). This data is summarized in Table 2. Because there are only 14 traits, exclusion of the reversing traits, as in Table 1, would have left only a few traits to consider. On the other hand, simply amalgamating the progressive and reversing characters for the sake of a larger database would have created bias in the data.20 As a compromise, both potential biases were set at cross-purposes towards each other by creating two separate columns in Table 2. These reflect the distinction I have made between all 14 traits (first column), and the five consistently progressive traits21 (second column). The small number of characters also necessitates a different approach, from that used in Table 1, in computing the Mammalness Index. Because there are only 14 traits, if one were to, as before, compute the relevant quotient and then multiply it by 100, it would cause serious distortion of the data.22 For this reason, the Mammalness Index in Table 2 is simply the sum of character polarities for each taxon. Table 2. Mammalness index for mammal-like reptiles calculated from quadrate skeletal characters from Luo and Crompton.19 ID numbers and descriptions are explained in Table 1. The third database (Table 3), like the first database, is relatively comprehensive, compared with the second database. Table 1 can be pictured as a broad overview of the entire chain of mammal-like reptiles, while Table 3 resembles a detailed close-up of the latter part of the chain. The third database is intermediate in size between the first and second.23 In Table 3, therefore, the progressive and reversing characters are treated the same as in Table 2, whereas the Mammalness Index is computed the same as in Table 1. The data in Table 3 also overcomes the limitations of the data in Table 1, which neglected ‘early mammals’ other than Morganucodontidae from consideration (as this would have largely limited the characters in Table 1 to those of the dentition24). In fact, Luo10 deliberately focused his analysis on cranial and dental characteristics. Luo’s analysis is more of a detailed view of the latter part of the ‘evolutionary’ chain, and as such, complements Table 1. Table 3. Mammalness index for mammal-like reptiles calculated from dental and cranial characters from Luo.10 ID numbers and descriptions are explained in Table 1. As discussed earlier, I have made every concession to the evolutionist. I have not disputed the validity of intercontinental biostratigraphic correlation, the temporal succession of mammal-like reptiles, the objectivity of anatomical analyses, the fact that cladograms are not intended to identify ancestor-descendant relationships, etc. Despite all these concessions, the evidence, taken as a whole, fails to conform to all the evolutionary ‘ballyhoo’ surrounding the mammal-like reptiles. The abundance of reversing traits means that the mammal-like reptiles cannot, by any stretch of the imagination, be portrayed as some sort of quasi-lineage (even a crude one) culminating in mammals. (Nor, for that matter, can individual mammal-like reptilian genera be placed in a lineage. According to Kemp,28 few extinct vertebrates are sufficiently unspecialized, in terms of morphology, to be the direct ancestors of other vertebrates). The large number of reversing traits also takes to task the evolutionistic claim about stratomorphic intermediates. To begin with, stratomorphic intermediates have validity only if one can legitimately infer ancestor-descendant relationships. This is not true of mammal-like reptiles, as noted earlier. Can it be said, in the context of mammal-like reptiles, that a less mammal-like genus will inevitably be situated stratigraphically below a more mammal-like one? Apart from the fact that this argument takes the biostratigraphic correlation of mammal-like reptiles at face value (as I have done for purposes of this study), any such notion is soundly contradicted by the numerous reversing traits uncovered by this analysis. It is sobering to realize that a given mammalian trait can appear, disappear, and then freely reappear anywhere throughout the entire evolutionary-constructed sequence of mammal-like reptiles. As a result, if all of the mammalian traits are considered together, it becomes obvious that any ‘stratomorphic’ sequence of mammalian traits as a whole is crude at best. Mechanisms related to the Biblical Flood should have no difficulty generating a sequence of organisms that happens to show a crude stratomorphic progression of mammalian traits interspersed with numerous other traits showing no progression at all (that is, the reversing traits). Of course, evolutionists have a series of stock rationalizations to cope with reversing traits. They can, for instance, allow for some traits to actually reverse themselves during the course of supposed evolution. But this makes their whole argument internally inconsistent: we are asked to believe that the ‘progressively-appearing’ mammalian traits constitute powerful evidence for evolution, while the more numerous reversing mammalian traits do not mean anything. Heads I win, tails you lose. And, owing to the fact that cladograms are not presumed to identify ancestor-descendant relationships, the evolutionists can always pigeonhole any reversing trait as a ‘specialization’ in that particular mammal-like genus.25 This allows them to ignore contrary evidence and to perpetuate their illusion of a generalized ‘chain’ of mammal-like reptiles that becomes progressively more-mammalian. From Tables 1–3 we see that the traits usually considered unique to mammals are distributed variously throughout the mammal-like reptiles. While this distribution is not haphazard or random, it does not form lineages. We will now see that the remaining gaps between these organisms are not gradualistic. Remember that mammal-like reptiles are not just any group of extinct creatures. They are supposed to be the very showcase of step-by-step, transition-filled evolutionary change. On this basis alone, the mammal-like reptiles should be subject to the strictest standards for evaluating alleged gradational evolutionary changes. Thus, the significance of morphological discontinuities becomes magnified. Second, as noted earlier, whatever step-by-step changes to the mammalian condition do exist, these come only at the cost of having to discard large numbers of anatomical traits because they are reversing—i.e. appearing, disappearing and reappearing in the chain. If, despite such treatment, the discontinuities can be shown to be significant in those relatively few traits which are unmistakably progressive to the mammalian condition, the credibility of mammal-like reptiles as genuine evolutionary transitions becomes all the more doubtful. Third, and most important of all, the magnitude of any discontinuities must be addressed. Are they large or small? To answer this question, we must compare the size of each discontinuity with the range of anatomical information available from known fossils.30 Using the same methodology employed to score inferred morphological changes throughout the presumed evolution of mammal-like reptiles, one can place the discontinuities into a semi-quantitative perspective. Consider the most comprehensive sequence of mammal-like reptiles (Table 1). We can see the precipitous gap between the pre-therapsids (0–5) and therapsids (29–52). From the vantage point of the Mammalness Index of 120 for the listed inferred first mammals (the Morganucudontidae), the mammal-like traits in pelycosaurs and sphenacodonts are trivial in magnitude. This gap is all the more extreme because pelycosaurs and therapsids are each large, internally-diverse groups. This is only the beginning. It is eye opening to realize that the discontinuity between the therapsids (29-52) and cynodonts (80–109), at 28 points, is greater than the entire range of mammal-like traits within the evolution of the therapsids themselves, the latter of which amounts to 23 points! The gap within cynodonts (80–87 vs. 101–109), while not as extreme, is nevertheless appreciable, and, at 14 points, is greater than both the ranges of the antecedents (7 points) and successors (8 points). Those with a strong background in vertebrate anatomy may want to consult the original sources and examine how the anatomical technicalities (here just summarized as numbered traits) fail to resemble anything like a gradational appearance of mammalian traits in the evolutionistic-constructed ‘chain’ of mammal-like reptiles. When the appropriate anatomical details of the middle part of the chain of mammal-like reptiles is analyzed, we find that the non-transitions grow in size. Consider all the characters relative to part of the inferred aural-mandibular evolution from mammal-like reptiles to mammals (Table 2). One is struck by the abrupt discontinuities between therapsids and early cynodonts (1–6), on one hand, and the advanced cynodonts (13, 15), on the other (we are, for a moment, excluding the trithelodonts and the tritylodonts). When we consider the latter two, both of which are the possible evolutionary sister groups of the earliest mammals, we observe yet another gap—between them (13, 15) and the inferred earliest mammals (20–25). In both instances, the gap is, once again, larger than the actual range of ‘mammalness’ that both precedes and follows the gap. The foregoing analysis of Table 2 actually understates the magnitude of the gaps because, as noted earlier, it does not consider the ‘smoothing-out’ effects caused by the inclusion of the reversing characters. Consider just the progressive characters in Table 2. Under such conditions, the discontinuities are stark. With the exception of the last member of the chain (the Morganucodontidae), every change in the sequence involves a series of jumps in increments of 2 or (usually) 3, and each such jump is relative to only 13 character points. Probably the most informative analysis of mammal-like reptiles as (alleged) transitional forms is the one which focuses, in detail, on the presumed changes from advanced cynodonts to the earliest mammals (Table 3). The sister-group cynodonts (Tritylodontidae and Trithelodontidae) rival each other for the status of the closest non-mammalian relatives to mammals. Yet, when all of the characters are considered, one is struck by the chasm between these sister-group advanced cynodonts (58 and 78) and the earliest presumed mammals (100–139). However, the ‘bottom falls out’ when only the progressive characters are considered in Table 3. Here, a giant evolutionary leap is required to make the presumed change from fairly advanced cynodonts (7) to the advanced sister-group cynodonts (34 and 54). From there, another great gulf must be spanned in order to link the sister-group cynodonts (at 34 and 54) with the earliest mammals (104–131). ‘Primitive’ and ‘derived’, of course, are in comparison with the presumed earliest mammals, though neither the trithelodonts nor the tritylodonts are capable of being connected to the inferred earliest mammals in an ancestor-descendant lineage. Table 3 shows that a near doubling of characters (in fact, tripling if Tritheledontidae is chosen as the sister-group) is necessary to bridge the chasm between the sister-group cynodonts and the inferred primitive mammals. For evolutionists who portray the sister-group cynodonts as ‘almost mammals’, this is a sobering result. Mammal-like reptiles may indeed qualify as the very best examples of transitional evolutionary change that evolutionary theory has to offer from the fossil record. This only shows the barrenness and intellectual poverty of macroevolution. When all of the characters used for the conventional constructions of cladograms are considered, the majority of mammal-like reptile characters do not consistently progress towards the mammalian condition. Instead, within the ‘evolutionary’ chain of mammal-like reptiles, there are many ‘reversals’ away from mammalian characteristics. The use of mammal-like reptiles as an argument for ‘transitional change’ (however one strictly defines it) rests upon special pleading (like everything else in evolutionary theory). So let us permit the evolutionist special pleading and pretend that the large numbers of reversing traits don’t exist, so that the argument can be based solely on the progressive characters. Even this does not let the evolutionist off the hook. To the contrary, the chain of mammal-like reptiles, when examined closely and with attention to many (instead of just a selected few) anatomical characters is full of major discontinuities. And very many of these discontinuities are as large, if not larger, than the ranges of characters which both precede and follow them. Therefore, the oft-repeated evolutionistic claim about mammal-like reptiles showing a series of intermediate stages to the mammalian condition is, at best, an exaggeration. Could not the evolutionists argue that, as more fossils are discovered, the gaps will close? Perhaps. At least they have been trying to do so since the days of Darwin, but with little success, despite a vastly larger known fossil record. Remember that, as shown elsewhere,38 new fossil finds can just as easily accentuate the gaps as reduce or close them. Consider three new genera that have been described in the 1980s and 1990s: Sinoconodon, Adelobasileus and Haldanodon. As noted earlier, not enough is preserved of Adelobasileus to include it in Tables 1–3. When it comes to Sinoconodon, its existence does narrow the gap in Table 3 that would otherwise exist without it, but not by much in comparison with the gap that remains afterward. Haldanodon, on the other hand, cuts the other way. By virtue of the fact that its characters fall within the range for previously-known primitive mammals, its very discovery actually reinforces the gap between cynodonts and mammals. Clearly, the ruling evolutionary paradigm existed before the discovery of mammal-like reptiles, and would have flourished had these reptiles never been discovered. In that event, today’s evolutionists would be extolling some extinct amphibian group as the transitions (or stratomorphic intermediates) leading up to mammals. Cladograms would be constructed to show the close branching pattern between that chosen group of amphibians and mammals. All else would fall in place according to the dictates of evolutionary dogma. The evolutionist triumphalists would be telling everyone that evolution is fact because of the many obvious similarities between the ‘ancestral’ amphibians and the ‘descendant’ mammals. Compromising evangelical evolutionists would preach about the fact that God would never mislead us by separately creating mammals and amphibians with so many shared structures. Leading humanist scientists would inform us that anyone who questions the amphibian-mammalian transition cannot possibly be a scientist, no matter his degrees or publications. And, of course, the secularist fanatics would whip up considerable hysteria about the fact that the questioning of the amphibian–mammalian transition is a dangerous threat to the very survival of science and reason, and that, if not quickly reversed, it will soon return us to the Dark Ages. Rubidge, B.S., Did Mammals Originate in Africa? Sidney Haughton Memorial Lecture 4, pp. 4–5, 1995. There are no therapsid genera common to the Upper Permian deposits of Russia and South Africa. Return to text. Wagner, P.J. and Sidor, C.A., Age rank/clade rank metrics—sampling, taxonomy, and the meaning of ‘stratigraphic consistency’, Systematic Biology 49(3):473, 2000. Return to text. Mehlert, A.W., A critique of the alleged reptile to mammal transition, Creation Research Society Quarterly 25(1):7–15, 1988. Return to text. Mehlert, A.W., The origin of mammals, Journal of Creation 7(2):122–139, 1993. Return to text. As discussed in conjunction with the ‘characters’ in Figure 1, most nodes (branching points) in the cladogram, including those actually used for mammal-like reptiles and cited in this work, use only two numbers: ‘0’ to mark absence of a trait and ‘1’ for its presence. A few other traits, notably those which are gradational, use a series of numbers to indicate the degree of derivation of an anatomical trait (e.g. 0, 1, 2, 3). Return to text. Woodmorappe, J., Noah’s Ark: A Feasibility Study, Institute for Creation Research, El Cajon, p. 5, 1996. Return to text. King, G.M. and Rubidge, BS, A taxonomic revision of small dicynodonts with postcanine teeth, Zoological J. Linnean Society 107:131–154, 1993. Return to text. Cox, C.B., The jaw function and adaptive radiation of the dicynodont mammal-like reptiles of the Karoo basin of South Africa, Zoological J. Linnean Society 122:349–384, 1998. Return to text. An apomorphy is a trait that appears for the first time at a given position in the cladogram, as reconstructed by evolutionists. Thus, for instance, in Figure 1, the ‘X-morph’ is apomorphic to ‘organism’ (B), and the ‘cap-morph’ is apomorphic to ‘organism’ (E). Return to text. This approximates the relative position each taxon would have on one comprehensive cladogram (that is, were all of the data in Tables 1, 2 and 3 to be melded together). However, it is not meant to imply that this is necessarily the exact cladistic sequence into which all of the taxons would be simultaneously placed relative to each other. Return to text. These descriptors are solely for purposes of communication and are not necessarily meant to imply agreement with the taxonomic description. Thus, for instance, referring to certain taxons as ‘early mammals’ follows the cited authors but does not imply endorsement of the belief that such taxons qualify as mammals. Return to text. Kemp, T.S., Mammal-like reptiles and the origin of mammals, Academic Press, London, 363 pp., 1980. Return to text. This, of course, is from the vantage point of so-called early mammals as the presumed outcome of the alleged evolutionary process acting upon mammal-like reptiles. It is not meant to imply that evolution was goal-directed to mammals in any way (a position which virtually all evolutionists reject). Return to text. Sidor, C.A. and Hopson, J.A., Ghost lineages and ‘mammalness’: assessing the temporal pattern of character acquisition in the Synapsida, Paleobiology 24(2), Appendix 1, pp. 269–270, 1998. The 181 character traits are identified and described in the Appendix 2, pp. 271–273. Return to text. I have omitted Estemmenosuchus and Sinoconodon from this part of the database because large numbers of their respective character traits are unknown. The 93 rejected characters are accounted for in Ref. 25. Return to text. Relative to the 181 numbered anatomical characters culled from Sidor and Hopson, Ref. 15, Appendix 1 and 2, the 88 suitable characters entered into Table 1 bear the following numbers: 5–7, 9, 11–15, 17–20, 22, 24–27, 29–30, 32, 35–37, 39, 46–47, 49–50, 51, 53, 56–57, 63–72, 74–75, 77, 80, 82, 84–92, 95, 101, 113, 117, 123, 126–127, 129, 131–138, 144–145, 155–156, 158–160, 163, 165–170, 174. Return to text. For example, suppose that there is information available for 80 of the 88 relevant character traits, and the sum of character polarities is 60. The Mammalness Index in this case is (60/80)(100), or 75. Return to text. Luo, Z. and Crompton, A.W., Transformation of the quadrate (incus) through the transition from non-mammalian cynodonts to mammals, J. Vertebrate Paleontology 14(3):360, 1994. The 14 characters are described in Appendix 1, pp. 373–374. Return to text. The nature of the bias was already discussed in connection with the progressive versus the reversing changes in ‘organisms’ (A) through (G) in Figure 1. Return to text. The progressive traits in the Luo and Crompton, Ref. 19, database bear the following numbers: 1, 3, 5, 8, 14. Return to text. This bias is essentially a small-numbers effect. For example, imagine a situation where one genus has a score of 8 relative to 10 characters, and the other has a score of 11 relative to the 10 characters. Now, in another situation, one genus has a score of 40 relative to 50 characters and the other has a score of 55 relative to 50 characters. In both cases, the Mammalness Index is technically the same: 80 and 110, respectively. But this has little practical meaning in the first case, as only 3 points separate the first and second genus. Return to text. Owing to the fact that many character polarities were missing for Adelobasileus as well as Kuehneotheriidae, both were omitted from Table 3. However, had they been included, the trends shown in Table 3 would not have been altered to an appreciable extent. Return to text. Sidor and Hopson, Ref. 15, p. 257. Return to text. Of the 93 characters omitted from this analysis, 16 were excluded for the sole reason of being of unknown character-polarity for a large number of taxons. The remainder (77) were rejected because they were not consistently progressive towards the mammalian condition, as discussed in the text. Return to text. Some characters used by Sidor and Hopson (Ref. 15), notably those which they numbered 3, 10, 28, 41, 44, 52, 102, etc., underwent more than two reversals of progress that each had previously made towards the eventual mammalian condition. Return to text. One additional character (No. 39 in Luo, Ref. 10) was rejected because its character-polarity was unknown for too many taxons. This left a total of 28 progressive characters and 53 reversing ones available for the present study. Return to text. Kemp, Ref. 13, pp. 13–14. Return to text. Luo and Crompton, Ref. 19, p. 340. Four different versions of cladograms are presented, with each one supported by one set of evolutionists. My descriptions involve two of these: (A) and (C). Return to text. This can be likened to a 1-cm gap between individuals. The significance of the gap obviously depends on context. Consider the following two extreme examples to make my point. If the 1-cm gap is between elephants on parade, the gap is trivial. But if it occurs between individual bacterial cells on parade, each 1-cm gap is enormous. The evolutionary ‘chain’ of mammal-like reptiles is much closer to bacterial cells on parade than to elephants on parade. Return to text. To appreciate this situation, imagine for a moment that all mammals except for bats were extinct and unknown, and all flying creatures except bats were also extinct and unknown. The ability of an animal to fly would then erroneously be accepted, by some extraterrestrial intelligent observer, as an essential feature of being a mammal. Once the fossils of birds, insects, pterosaurs, etc., were discovered, the extraterrestrial investigators would erroneously suppose that birds, insects, pterosaurs, etc. must have been quite mammal-like by virtue of their ability to fly! Return to text. Kielan-Jaworowska, Z., Interrelationships of Mesozoic mammals, Historical Biology 6(3):195, 1992. Return to text. Luo, Ref. 10, p. 98. Return to text. As noted earlier, the numerous reversing characters that are prominent throughout the chain of mammal-like reptiles soundly refute the claim that mammalian traits appear in a straightforward stratomorphic sense. The fact that the ancestral Tritylodontids are more mammalian than their presumed early-mammalian successors only drives the final nail into the coffin. Return to text. Luo, Ref. 10, p. 111. Return to text. Allin, E.F. And Hopson, JA, Evolution of the auditory system in Synapsida; in: The Evolutionary Biology of Hearing, Springer-Verlag, New York, Berlin, p. 608, 1992. Return to text. Carroll, R., Between fish and amphibian, Nature 373:390, 1995. Return to text. Woodmorappe, J., Does a ‘transitional form’ replace one gap with two gaps? 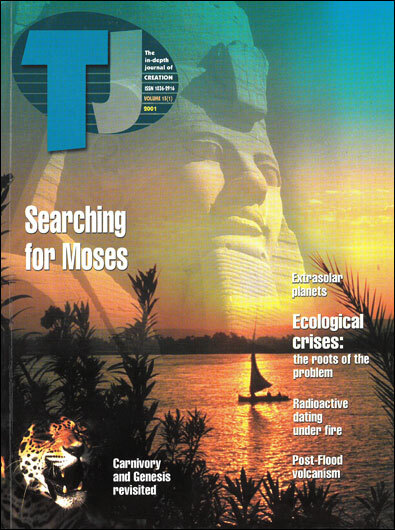 Journal of Creation 14(2):5–6, 2000. Return to text. Armstrong, S., Fossil hunter of the Karoo, New Scientist 149(2015):38, 1996. Return to text. Cain, JA, Creationism and mammal origins, J. Geological Education 36:98, 1998. Return to text. Melhert, Ref. 4, p. 132. Return to text. Stearn, C.W. And Carroll, R.L., Paleontology: The Record of Life, John Wiley & Sons, New York, p. 268, 1989. Return to text.